1 Preheat the oven to 200°C, gas mark 6. Cut the garlic bulbs in half horizontally, place onto a large sheet of foil and drizzle with 1 tbsp of the olive oil then wrap up. Bake for 40 minutes or until soft and caramelised. Remove and set aside. 2 Place the flour, yeast, salt and sugar in the bowl of a stand mixer, or large mixing bowl if making by hand. Make a well in the centre, pour in 300ml warm water and the remaining 2 tbsp olive oil. Knead for 5 minutes in a stand mixer or 10 minutes by hand until smooth and elastic. Place in a lightly oiled bowl, cover with clingfilm and leave in a warm place for about 1 hour, or until doubled in size. 3 Tip the dough out of the bowl onto a surface dusted with polenta. Knead in half of the chopped rosemary and divide the dough into 2 equal pieces. Roll each piece into 3mm-thick rounds, about 30cm in diameter. Sprinkle 2 flat baking sheets generously with polenta and lay the dough circles on top. 4 Squeeze the roasted garlic out of its papery skin and dot over the pizza bases. Toss the red onion slices in the garlic infused olive oil and scatter over the pizzas with the potatoes, Taleggio cheese and remaining rosemary. 5 Preheat the barbecue, if using, to medium and the oven to 200°C, gas mark 6. Place the pizzas in the oven to cook for 15 minutes, until golden and risen. 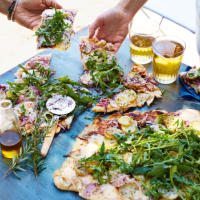 If using the barbecue, slide the cooked pizzas off their baking sheets onto the barbecue rack and cook for 2 minutes, to chargrill the bases — this gives them a great flavour. Scatter with rocket and cut into slices to serve. This recipe was first published in Fri Jul 10 12:13:03 BST 2015.